carNAVi S 510, the latest creation from carNAVi, a revolutionary navigation system - ultra slim (11mm) with the latest 800MHz Dual Core GPS processor, large 5.0-inch high quality touch screen, extra large 4GB build-in memory and multimedia functions with integrated MP3 and Video player. carNAVi GPS leads your way with voice guided turn-by-turn directions to get you there on time and keep you safe on the road. 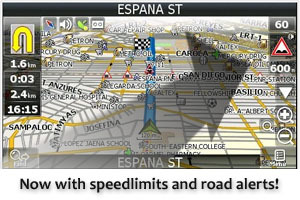 Preloaded with high detailed quality roadmaps covering the entire Philippines including many thousand points of interest (POI) with perfected routing and address search, detailed maps of Malaysia and Singapore including a worldwide map of major roads and highways, it’s versatile and easy to use. Additional detailed maps* of Cambodia, Indonesia, Vietnam, Taiwan, Hong Kong, Thailand and many other countries in Asia and selected cities worldwide are available in the carNAVi Store online free of charge. The S 510 is powered by a new 800MHz Dual-Core GPS Processor and we have doubled the RAM for better navigation performance. With a an extra large 5.0-inch glossy widescreen display, you’ll always get a brillant picture. carNAVi S 510 has an ultra slim design (only 11mm) to fit comfortably in your pocket. Outside your car its rechargeable lithium-polymer battery makes it convenient for mobile navigation on foot with up to 4 hours’ usage between charges. The unit comes with a Micro SD card slot, expanding the memory for multimedia files like MP3 and Videos up to 32GB. Like all carNAVi's the new device is preloaded with Speedlimit and Road Alert warnings which informs the driver in the case of overspeeding or warn affront bumpy railroads or sharp curves. * Latest map guarantee with free lifetime map updates for the Philippines. and Mac OS X 10.6 or later. *** Buy online and get your navi delivered to your doorstep within 1-2 days. *** ONLY ONLINE, refurbished products are not available in outlet stores. For latest updates visit this product's support page.